Speaking of older motels, here's a photo I took a little over a year ago while on a trip to Miles City. 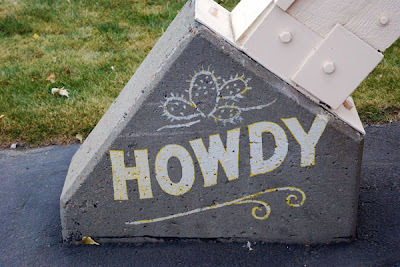 I stayed at a faded chain motel on the south side, probably built in the 1970s or so, and I noticed this welcoming message painted on the concrete footing of the building's porte cochere. That little sign was easily the best part of the whole motel!